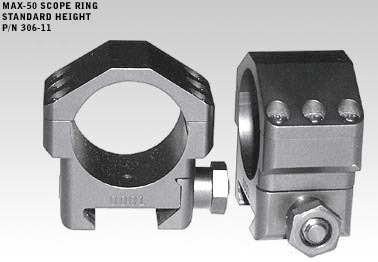 The MAX-50 rings are ONE Inch wide, giving them 60% more holding power than any other ring available. Utilizing 6 #8-40 Torx screws to distribute the load providing the Maximum amount of holding power while minimizing the chance of damaging the scope. Machined from steel as “Matched Pairs” and serialized. Mil-Std-1913 compatible (Picatinny optic mount) designed for the demanding .50 BMG round.